The last time I was in California, my sister and I discovered this great little place to eat on Balboa Island in Newport Beach. Normally we have Mexican Chicken Soup at Picante Martin’s, but alas, they were closed for remodeling. We were crushed. What in the world were we to do? We always get our soup there, then “hippo cookies” (cut-out sugar cookies with frosting) or Balboa Bars (ice-cream bars dipped in chocolate and then nuts or candy) at the place next door. Our tradition was about to be squashed…so we took a walk up and down the main drag on the island and stumbled upon this little place called “Crocker’s”. They serve mostly hot dogs and polish dogs, but we discovered they had clam chowder as well. What a huge relief! 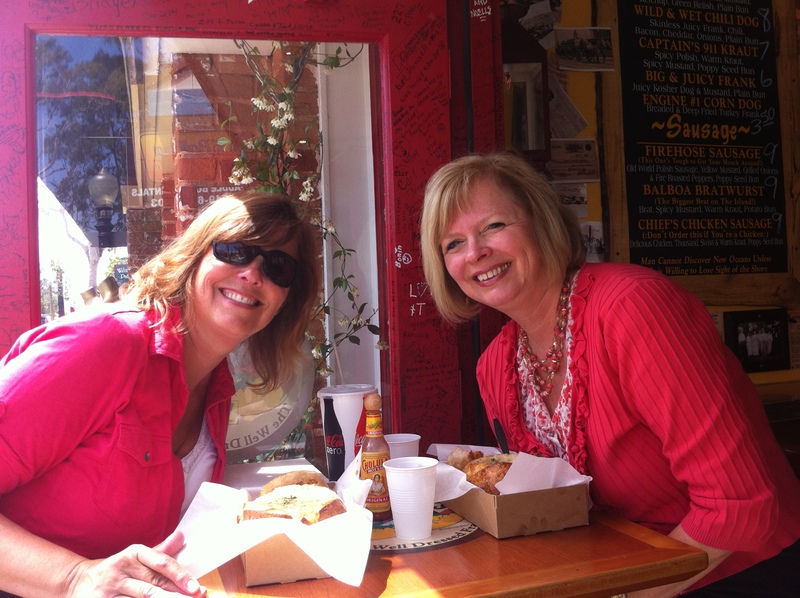 Thankfully, we were both in the mood so we moseyed on in and placed our order…2 clam chowders in sourdough bread bowls, please. Here we are enjoying this wonderful soup. That’s Suzy on the left and me on the right. 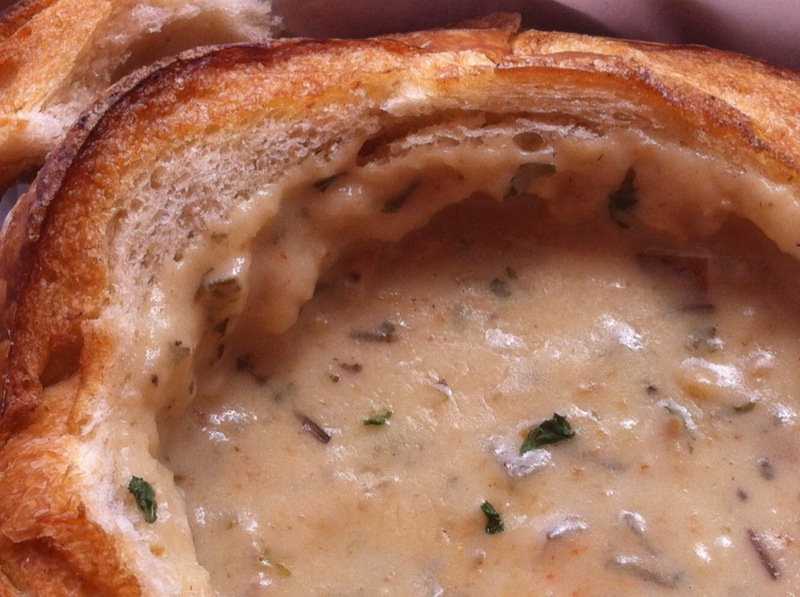 What we didn’t anticipate was just how warm, thick and delicious this clam chowder would be. 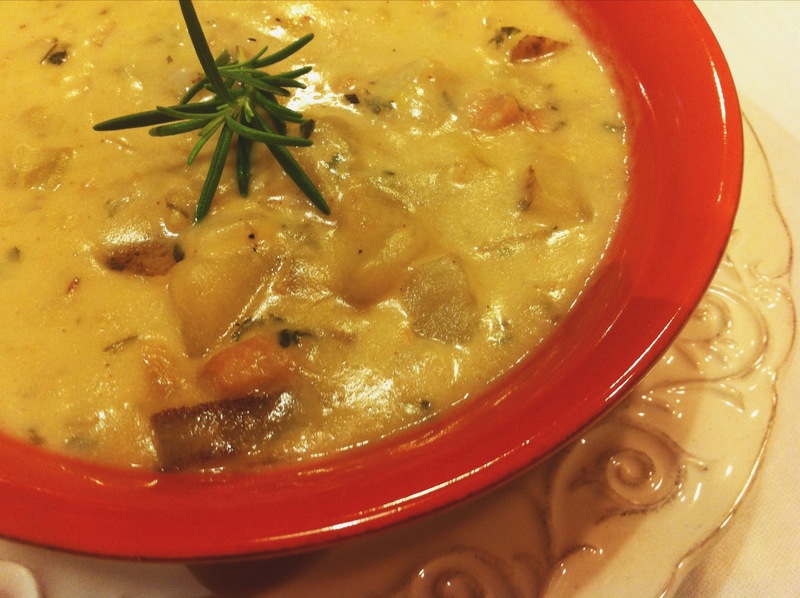 Full of the normal chowder ingredients, celery, onions, potatoes and clams, this recipe went one step further by adding…fresh rosemary, and lots of it. Yum! We enjoyed it so much, that we went back the next day and ordered more for take-out. After returning home to Utah, I was having serious “chowder cravings” so I called and asked Crockers if they would share the recipe. The owner was out-of-town but the nice manager took a message. While I had her trapped, I asked two very important questions: what they use for thickening and how their chowder happens to be a caramel color? Most chowder recipes come out pure white you see. Turns out they use a “thickening base” purchased commercially which I wouldn’t be able to get a hold of nor would I try because it’s most likely loaded with some kind of additives which can’t even be pronounced. I pressed a bit further and asked if caramelizing the onions contributes and the answer was yes. Now I had enough information to go into my science lab (kitchen) and experiment. I never did hear back from the owner of Crockers, but I’m happy to report that I came up with a soup that is very close to theirs. I hope you enjoy making and eating it as much as I did! Chop onions and celery. Heat butter and olive oil in a stock pot until the butter is melted. Key: turn the heat up to medium-high. Add the onions and celery and sauté until cooked through and golden brown. You want this mixture to turn a nice rich color, but not to burn. Stir well and scrape down those “brown bits” from around the pan. Clean and chop the potatoes in small-ish pieces…about 1/2″. Yes, leave the potato peel on – makes this soup more rustic and closer to the original. Throw the potatoes into your pan. Then add the 2 cans of chicken broth. Simmer about 15 minutes or until the potatoes are cooked through. Don’t boil on super high heat as you don’t want all of your liquid to boil out! Next, add the rosemary, parsley, clams and clam juice. Mix the flour into the cold half and half with a wire whisk until combined with no lumps. Pour this mixture into the soup and simmer until the soup is thickened. Add salt and pepper to taste. Serve warm in either a bread bowl or with sourdough bread. Sprinkle with a little chopped parsley and/or rosemary. Be prepared to feel comfort and joy! 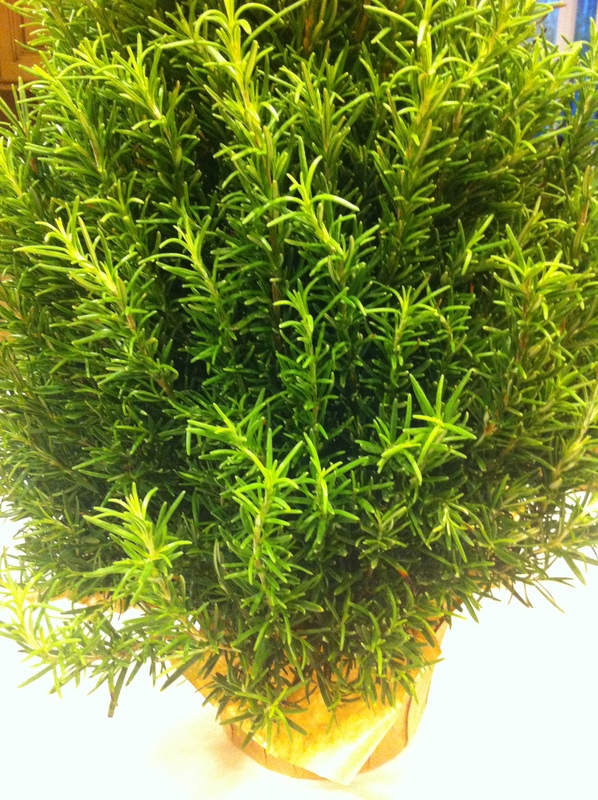 Liz Note: I got a rosemary “tree” at Trader Joe’s for only $6.99 and planted it in a pot on my patio. Now I can enjoy making clam chowder with fresh rosemary at least until it snows! Yummy! Reminds me of when we lived in Boston.